Last edited by Khalid Khattak on Mon Sep 14, 2015 1:32 pm, edited 1 time in total. Good luck, keep us posted on your progress! edit: keep wire management in mind too. Thanks for suggestion i will look how to optimize the design. Already orders all the electronics stuff and received them. Following are the links where i get all my stuff at good bargain price. I will keep sharing the links. Meanwhile my 3D model is for your review. The body took four hours. After lot of design iterations i came up with this fantastic design. 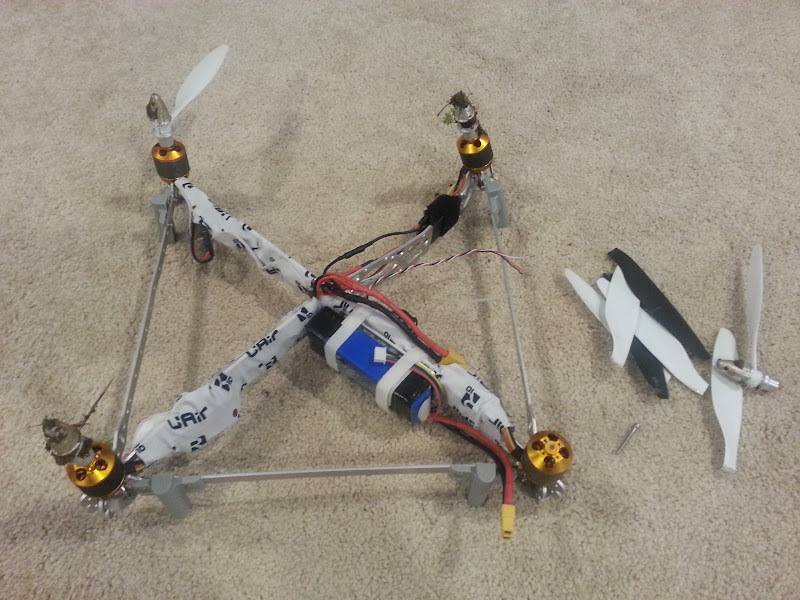 1- The arms of this quadcopter can be set at any angle. Even you can fold it. 2- The body can be extended or reduced. 3- This can turn into Square and H configuration. 4- The Aluminum machining was done on CNC and the motor mounts were 3D printed. Now I have to make the body of this quadcopter i.e. the center piece that will act as a bridge between the arms. So far the weight of Quadcopter as shown in following picture came out around 600gm. some more 3d modelling work i did recently. The first part i printed today.. Finally.. Found some improvement during assembling. Once electronics complete i will revise the 3D model and post in thingiverse. Still Work in Progress for the quadcopter. Modified the body a little bit. Here is the snapshot of Lipo Battery Holder (Lipo battery 14.8V 5000mah) Dimensions of the battery is: 136mm x 44mm x 39mm (LWH). The printing in progress. Man, I miss my quad. Barry, what happen to your quad? It tried to drill for oil. Was a kickstarter quad that the developer ran right after shipping all the quads. The brains never did work quite right, even after a couple firmware upgrades. The wires that hook to nothing on the right of the frame used to connect to the radio, it went for it's own flight after the quad did an uncommanded barrel roll while hovering. Radio came loose and hit a prop I think, never did find it. Hopefully the next kickstarter I supported works out better. I do know there has been much more developer communication with this one. Got some time to design and print the landing gears. The plastic parts can take load upto 2Kg and shock load upto 5Kg. What are the teardrop shaped extrusions for? Just "bumpers" or caps for the landing skids? Moved to the General FPV topics at your request. I left a shadow in the What are YOU making topic.